Curiosity, the big rover of NASA's Mars Science Laboratory mission, will land in August 2012 near the foot of a mountain inside Gale Crater. The mission's project science group is calling the mountain Mount Sharp. This informal naming pays tribute to geologist Robert P. Sharp (1911-2004), a founder of planetary science, influential teacher of many current leaders in the field, and team member for NASA's early Mars missions. This oblique view of Mount Sharp, is derived from a combination of elevation and imaging data from three Mars orbiters. The view is looking toward the southeast. 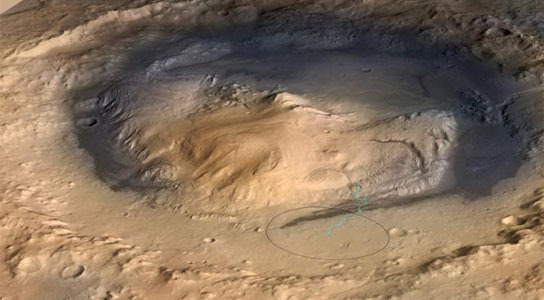 Gale Crater is 96 miles (154 kilometers) in diameter. Scientists hope to place Curiosity on flat ground at the foot of Mount Sharp inside Gale Crater. Once in position, Curiosity will examine whether the area has ever presented environmental conditions favorable for fostering microbial life, including chemical ingredients for life and energy for life. No mission to Mars dared approach it, though, until NASA’s Mars Science Laboratory mission, which this August will attempt to place its one-ton rover, Curiosity, at the foot of the mountain. The moat of flatter ground between the mountain and the crater rim encircling it makes too small a touchdown target to have been considered safe without precision-landing innovations used by this mission. To focus discussions about how Curiosity will explore the mountain during a two-year prime mission after landing, the mission’s international Project Science Group has decided to call it Mount Sharp. This informal naming pays tribute to geologist Robert P. Sharp (1911-2004), a founder of planetary science, influential teacher of many current leaders in the field, and team member for NASA’s first few Mars missions. Sharp taught geology at the California Institute of Technology (Caltech), in Pasadena, from 1948 until past his retirement. Life magazine named him one of the 10 best college teachers in the nation. “Bob Sharp was one of the best field geologists this country has ever had,” said Michael Malin, of Malin Space Science Systems, San Diego, principal investigator for two of Curiosity’s 10 science instruments and a former student of Sharp’s. “We don’t really know the origins of Mount Sharp, but we have plans for how to go there and test our theories about it, and that’s just how Bob would have wanted it,” Malin said. Caltech Provost Edward Stolper, former chief scientist for the Mars Science Laboratory, said, “For much of his more than 50 years at Caltech, Bob Sharp was the central figure in its programs in the geological and planetary sciences. One of his major contributions was the building of a program in planetary sciences firmly rooted in the principles and approaches of the geological sciences. Twice as tall as the sequence of colorful bands exposed in Arizona’s Grand Canyon, the stack of layers in Mount Sharp results from changing environments in which layers are deposited, younger on top of older, eon after eon, and then partially eroded away. Be the first to comment on "Curiosity to Investigate Mount Sharp for Clues of Past Life"